Originally named Keewaytinook Mobile and now K-Net Mobile is working with its partners to provide cellular phone and wireless data services in remote and rural First Nations. Phone and data products vary depending on which services individual users select when they purchase their phones and service provider. Please contact your Community Partner listed under Contact Info or contact TbayTel directly to order your preferred cell phone. Keewaytinook Okimakanak's (KO) Kuhkenah Network (K-Net - http://knet.ca) is establishing the Keewaytinook Mobile (KM) service to support remote First Nations to develop a local, community-owned mobile telecom business to provide cellular phone and data services. 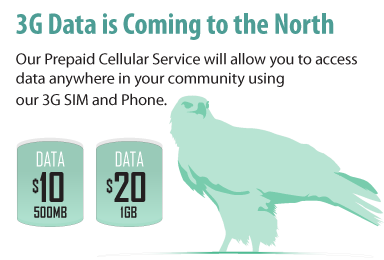 The First Nation Cellular Service works in partnership with the Keewaytinook Mobile (KM) network delivering local cellular and data service in First Nation communities across Northern Ontario. Communities are encouraged to work with KM to form their community cellular and data service plan to meet their unique needs and evaluate the community’s readiness of providing cellular service and joining this community-lead cellular network. The Community Cellular Service is projecting that the First Nation deliver the service using the same broadband service model, with technical and administration responsibilities (see attached Community Broadband Network diagram). Local administrative services resell the available products (pre-paid cards, phones and accessories) while technical issues are addressed by the local network technician who provisions and supports user services on the local equipment. K-Net and provider/supplier partnership roles are the responsibility of the KO team working closely with the community partner. Community benefits will be realized immediately including new skills, expanded responsibilities and training, increased telecommunication access for visitors and more options for local residents. The cellular network will support the ongoing operation and growth of the broadband network and the delivery of essential applications. The Community Cellular Service has the following requirements regarding existing local IP network and cellular readiness. Access to the wireless spectrum required to support the GSM protocol. The following topics are developed in partnership with the KM team to support the Community Cellular Service with interested communities. New opportunities can be realized in the near future to build on the cellular service. In addition to providing improved access to communication and safety when traveling, and when on the land; new health, education, employment and language applications can be realized. This change management process can positively affect the way in which our people learn and share and strengthen our culture and way of life.